My truck needed to be more POSITIVE and ENERGIZED! Since I updated to a QuickStart 160 Amp alternator from an OEM 110 Amp, I needed to up my game in the positive cable department. The QuickStart alternator came with an additional lug on the case for the negative cable to run to the negative terminal, but nothing for extra positive cables. I already had black wire and loom for the negative run. I went to a local starter/alternator re-builder in order to have the eyelets/ends put on securely. I did have to modify the terminal extension a bit in order to fit the way I wanted it to. I trimmed down non-conductive material that goes against the alternator which provides a much more secure connection. Pictures are below of the progress so far. 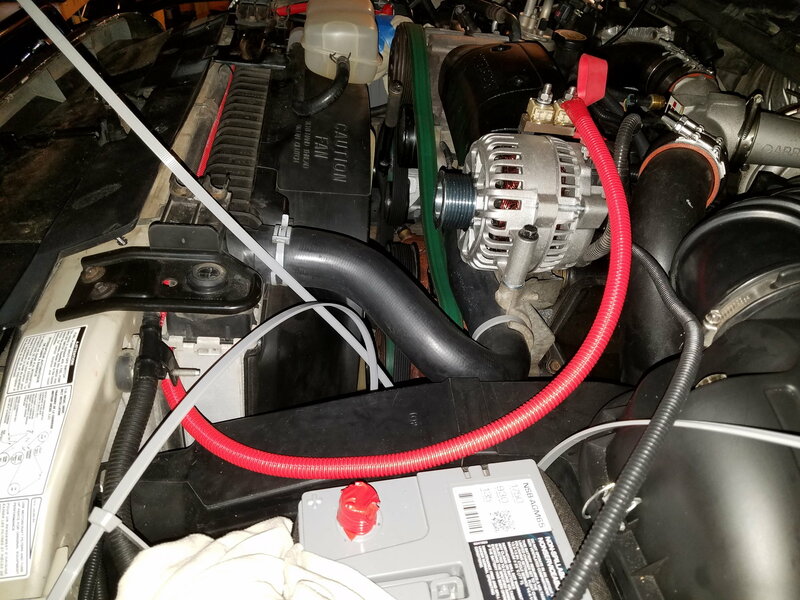 The driver side battery cable from the fuse block is about 8" too long and I don't like how it is sitting in the engine bay. I plan to take it to the local shop on Monday to have it cut down and a new eyelet put on it. 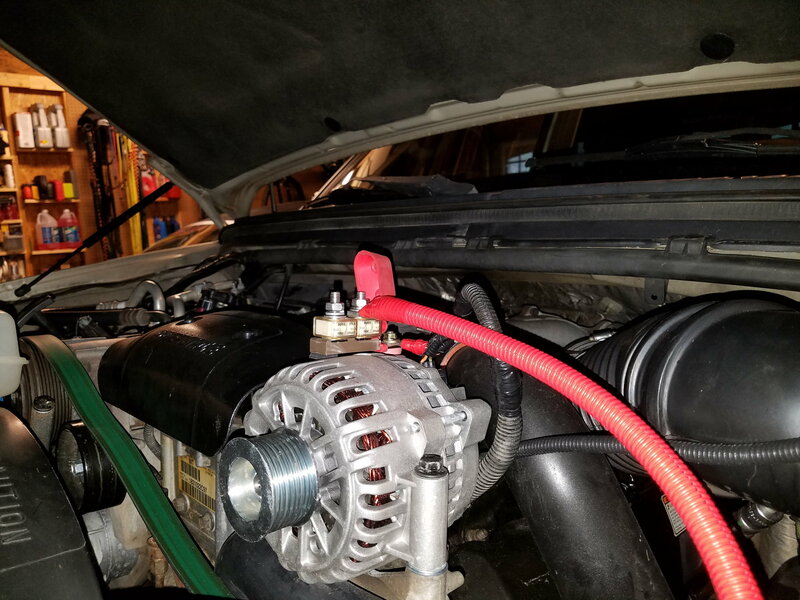 This should provide more than enough continuity for the B+ terminal on the alternator and help keep the alternator and batteries healthy for a much longer period of time. Cable from fuse block to passenger side battery. Cable from fuse block to passenger side battery. Driver side is missing due to it being too long. Terminal extension, OEM B+ lug and fuse block connection. Another side view of the fuse block from the driver fender area. Another view of the fuse block from the driver headlight area. I noticed that my alternator gets fairly hot. Its new and stock but definitely runs hot to the touch. Thanks for the compliment. I hate leaving such a simple project so close to completion, but the shorter cable I am not happy with and it would bug me if I "made it fit". I hope to have it back together Monday or Tuesday after work. 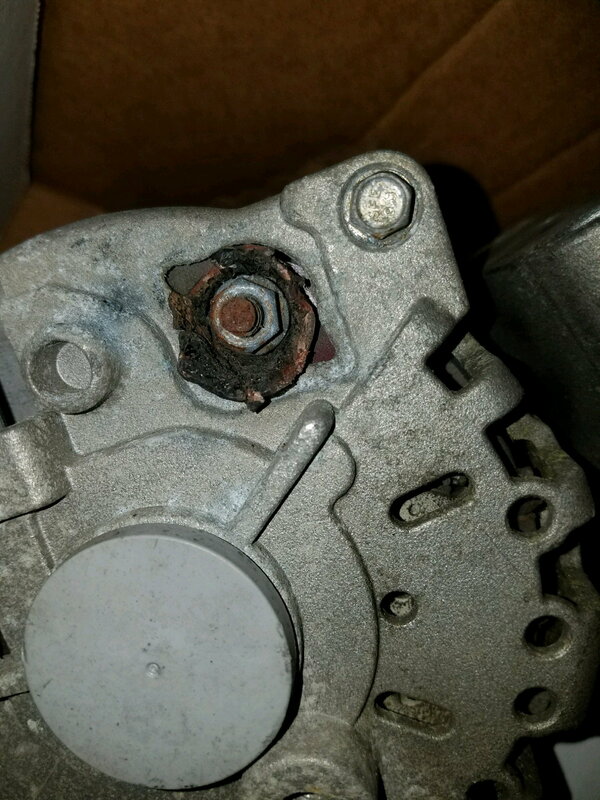 I need to get a picture of the OEM alternator, but noticed that B+ post had some temperature related damage to it when looking at it closer yesterday. I cannot say how long the alternator had been on there, but it has been there for the 4 years I have had the truck and looks a lot older than that. I plan to put some liquid electrical tape over the connection where the OEM B+ wire attaches to the fuse block. Might be overkill, but if the alternator and wiring stays in place for even just a year it will be worth the 30 seconds it takes to put the coating on it. Snapped a picture of the OEM terminal. Great job on the Grill and wiring Sous !! How is your hood clearance with the lugs on top? I just replaced my alt and it is very close with the standard lug. By far, the MOST IMPORTANT connection in a D.C. System is the GROUND Wire. I suggest, in addition to your up-grades, you add a (-) Cable (one size smaller than the (+) from the Alternator CASE to the (-) Post. The benefit is Reduced heat, better performance, and longer life. The clearance was a concern of mine as well. 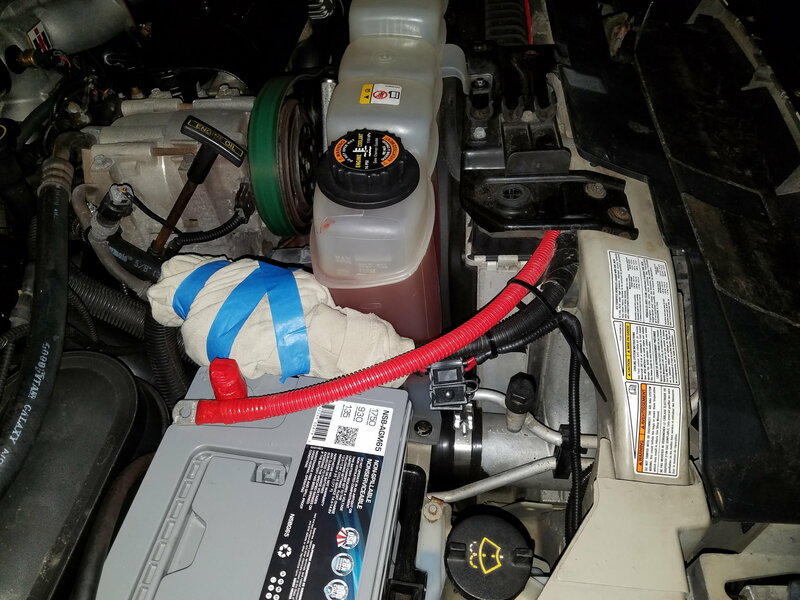 I took a lot of extra time and even put pieces of paper taped to the underhood liner to make sure there was no contact. In the end, there is easily 2" or so between the top of the lugs and the hood liner. Even then, there is a hard rubber cap (as seen in the picture) that goes over the lugs. This was not my original mounting method for the fuse block, but the only one that would work for my application. EDIT: So, in order to triple check the height, I "acquired" some lipstick from my wife and put some on the top of the red rubber cover for the lugs. The lipstick left no residue on the underhood liner. In addition, it looks like the top of the air box of my AIS is right about level with the top of the lugs. I can cut down the lugs a 1/4" or so if I really can't sleep thinking about it, but don't think that is necessary at all. Done sir! You may have missed it, but in the original post I mentioned that the QuickStart alternator came with a lug on the rear of the case for a negative cable to go to the driver side battery. You can actually see the negative cable in black loom in most of the pictures. It is the one that doesn't look right. It is not secured in any way because I wanted to make sure the positive cables are in place and secured before looking at ways to safely route the negative cable. 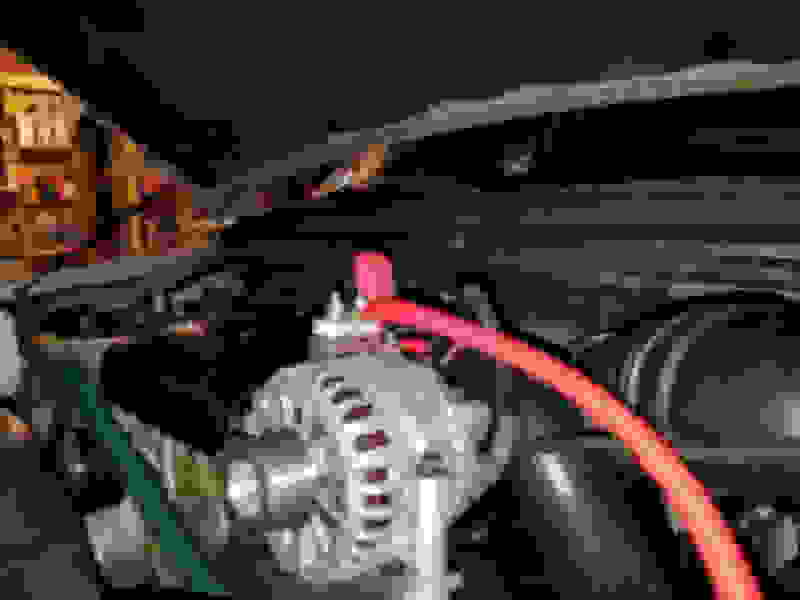 In addition, I already cleaned and re-secured the major ground connections on the block when I installed the headlight relay harness a year or so ago. That Engine Bay Looks GOOOOOOOOOOOOD! I never got to work on one like that! Most I pressure washed before doing the Job. Thanks for the compliment, but I thought it was dirty due to my OCD. I almost didn't post the pictures because I haven't had a chance to clean it well this winter. Hey Sous, I can't really tell, Does that Fuse Block kinda just sit on top, self-supported by the Post and riding on a flat on the Alt? or is it an illusion thanks to your exacting detail? I admit the pictures make it hard to see how the fuse block is situated over the alternator. It is well supported by the B+ extension, but again my OCD kicked in and said I needed to modify it a bit. There was a ring base at the bottom of the screw on top of the extension where the fuse block is installed. I welled out the fuse block mounting surface just enough to fit around that ring base. This made the fuse block even more secure and it did not move at all. The bottom of the fuse block is non-conductive material, so even if I put my foot on the block while standing on it and the base of the fuse block hits the alternator while the truck is running, nothing will happen. 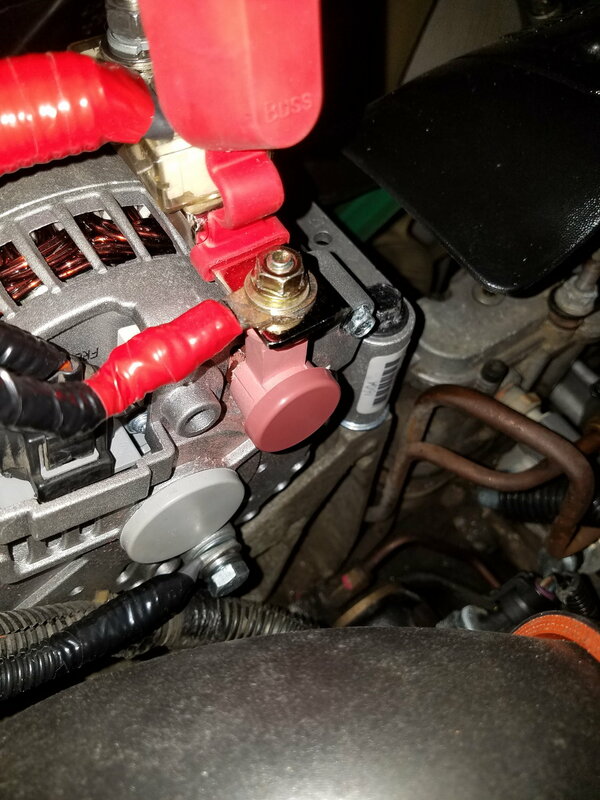 Just to make it a bit more secure, I had some hard rubber strips with adhesive on one side, if you look closely toward the front of the fuse block you can see them squeezed between the alternator and the fuse block. This provided even more support for the fuse block. I plan to post up some completed pictures this week once it is done. It really kind of irks me that I was that far off on the measuring of the cables, but so be it. I plan to keep an eye on the hard rubber I put on the bottom of the fuse block and simply remove it if I think it is a problem. 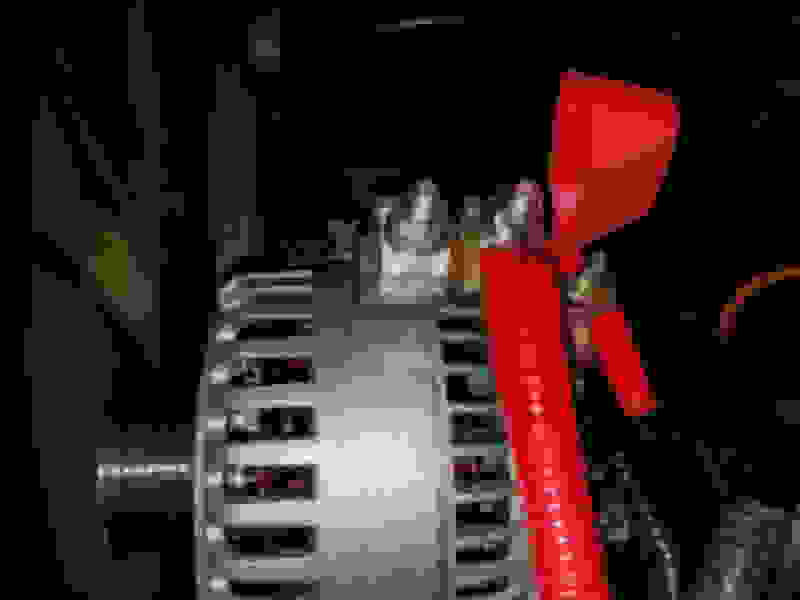 The fuse block sits about 5/16" above the alternator in the shortest part and the entire bottom of the fuse block is a hard ceramic or something. Once I get the wires secured, I will see if they prevent or promote movement of the fuse block in anyway. If they help secure it, I will probably remove the rubber stopper and leave the air gap so that heat will not transfer from direct contact to the fuse block. If this does not work, I will figure something else out for the fuse block and clock it a different direction or something, but this is the best I could come up with so far. I originally wanted to mount the fuse block vertically behind the alternator, but the CAC was uncomfortably close to the lugs/B+ terminals. Quick Reply: My truck needed to be more POSITIVE and ENERGIZED!